It's time to face the sun. 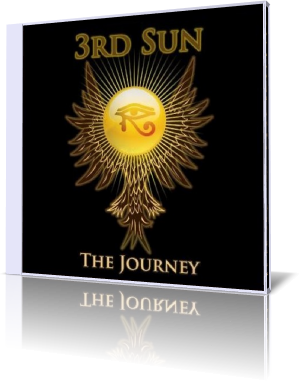 The 3rd sun! It's a project of Rob Young and Steve Dixon. Both performed together since their youth. The Journey is their debut album and their social contribution. A portion of the proceeds from The Journey will go to the "William B. Smith Transplant Fund" and "The Know Your Worth Foundation, Inc". Musicians on this album are Emanuel Burgess ( keyboards), Reggie Calhoun (guitar), Darryl Dixon (alto sax), Steve Dixon (drums), Deniz Felder (tenor sax), Peter Graham (guitar), Natasha “Nahjai Soul” Johnson (vocals), Noni Keyton (vocals), Demetre Simmons (keyboards), Rev. Victor Tate (inspirational word), Mike Waddell (guitar), Dave Watson (tenor sax, flute) and Rob Young (bass, keyboards, guitar & programming). All songs were composed and produced by Rob and Steve. Got To Get Away from here, is their advice. Relax with some wine. The song features the young singer Nahjai Soul, who impresses with her vocal style and is just on the start of a great career. Emotional Swing is a jazzy outbreak of the three matadors of this album Rob Young, Steve Dixon and Deniz Felder. Rob on bass and Deniz on sax define the melody line. On the moody Thursday's Rain Deniz Felder excels anew on sax. Frankfurt, Germany born Deniz Felder is currently member of the Uptown Entertainment Band. On the mystic You're Getting Closer Rev. Victor Tate spreads inspirational words of wisdom. My Heart Has Moved On shows gracious loops of excellent guitarist Reggie Calhoun. Not Coming Home speaks about a serious problem. The lost of a beloved person is interpreted by stirring singer Noni Keyton. A vocal talent always been involved in the performing arts. Mike Waddell's guitar cries in desperation. The instrumental style of Chakra Seven featuring Chops Horns reminds of past songs like Shaft. Something Special presents one more time the blessed singer Nahjai Soul with her raw unique timbre. Sax player Deniz Felder goes very close to his emotional highs on Morning After. He deeply improvises on the main theme or is it a melodious improvisation? I Got It Now is outside of many clichés. Loudness and turntable scratching. I have to wear sack clothes and ashes to understand this kind of music. More quality as intellectual and acoustic appetizer has Sapphire Stone featuring the blessed bassist Rob Young, flutist Dave Watson, and some more in a cool jam. On Hello Old Friend guitarist Peter Graham attracts with dynamic riffs. The Journey is diversity, musicality and especially freshness. Great instrumentals and vocals in balanced mixture.